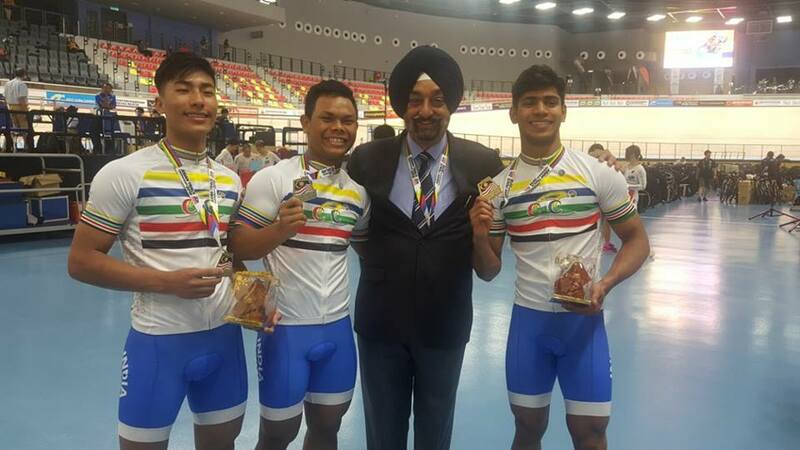 The 2018 Asian Track Cycling Championships will take place at the Velodrome Nasional Malaysia in Nilai, Malaysia from 16 to 20 February 2017. It is 38th Edition of Asian Track Championship. Esow Won Gold Medal in KEIRIN – Men Junior with brilliant timing of 10.989, earlier he clock brilliant timing of 10.549 in Semifinal, he also tops the heat with 11.106. In senior Keirin Sahil Kumar and Ranjit Singh both finish 5th in their respective heats but get a chance through Repechage to qualify for final. But again they disappoint and failed to Qualify for SemiFinal. In SCRATCH Men both Junior and Senior Men’s were disappointed as Bilal AHMAD (Junior) finish 11th (2 Lap down to Leader) while Rajveer Singh (Senior) failed to finish Race. Deborah Herold finish 6th in Senior 500m Time trail. Esow Won his 3rd Gold Medal. this time in 200m time trail – Men Junior with the timing of 11.045, earlier he clock timing of 11.939 in Semifinal, he also tops the heat with 10.506. Chinchakhandi Danamma finish 4th in Starch Women Junior with 420 points. mis bronze by few points. India End with 3 Gold and 1 Bronze to finish 5th in medal telly. India did not win medal in senior , while 4 medal in junior. Esow was cyclist of the the tournament for India who won 3 Gold and all with brilliant timing. Star cyclist Deborah Herold did not win any medal.